Responsible for greeting and providing service to 16-22 guests of all ages per seating, per evening in three themed dining rooms. During dinner, provides beverage service and assists Dining Room Server to ensure exceptional service. Maintains and ensures cleanliness of areas to uphold USPH and Disney standards. Also assists at fast food outlets and onboard/island buffets for breakfast and/or lunch. This role has high guest interaction and is a tipped position. Opens/closes all guest bars throughout the ship, island and crew areas. 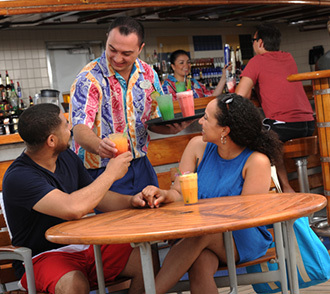 Proactively provides efficient and friendly beverage service in all indoor and outdoor bars, back of house service bars, lounges, nightclub and family entertainment venues, cafés, Crew/Officer bars and Castaway Cay bars and beach areas to not only guests, but fellow Beverage staff. Prepares and serves classic and tropical cocktails directly to guests and/or for Beverage service team. Verifies guests are of legal drinking age. Records daily sales; practices up-selling and suggestive selling techniques. Keeps areas stocked with all supplies. Maintains and ensures cleanliness of areas to uphold USPH and Disney standards. This role has high guest interaction and is a tipped position. 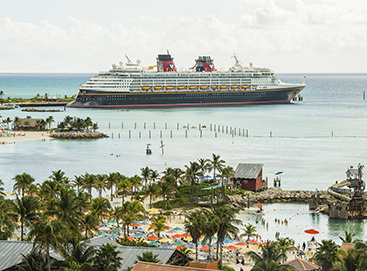 Proactively approaches guests and provides efficient and friendly beverage service in all indoor and outdoor bars, lounges, nightclub and family entertainment venues, cafés and Castaway Cay bars and beach areas. Verifies guests are of legal drinking age. Records daily sales; practices up-selling and suggestive selling techniques. Keeps areas stocked with all supplies. Maintains and ensures cleanliness of areas to uphold USPH and Disney standards. This role has high guest interaction and is a tipped position. Responsible for ensuring proper production of all menu items. Partners with Junior Sous Chef and Chef de Cuisine. Establishes food quality standards during storage, production and service. Monitors and ensures opening and closing procedures for all kitchens and production areas; ensures follow through with Cooks and Stewards. Maintains and ensures cleanliness of areas to uphold USPH and Disney standards. Cleans and maintains all guest public areas (public restrooms, atrium lobby, elevators, staircases and guest corridors, conference rooms, guest lounges, nightclub and family entertainment venues, cafés and Castaway Cay guest areas), and back-of-house guest and crew areas using various chemicals and cleaners. Handles and distributes luggage and special guest deliveries. Maintains and ensures cleanliness of areas to uphold USPH and Disney standards. This role has high guest interaction. Cooks quality food in a high-volume galley/kitchen environment. 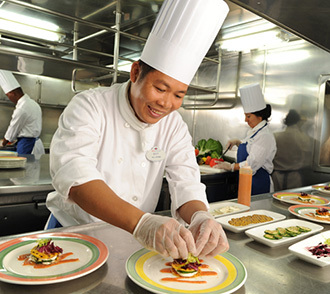 Responsible for extensive food preparation for breakfast, lunch, dinner and snacks available onboard. Preps and peels vegetables, slices cheese, makes salads, prepares sauces and preps various menu items. Maintains and ensures cleanliness of areas to uphold USPH and Disney standards. 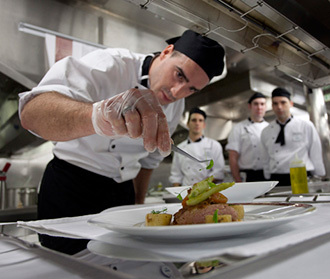 Various levels of Cooks and Chefs exist within the galley department. Culinary experience is required. Washes, rinses and sanitizes a very large volume of dishes, pots, pans and other galley utensils. Operates ship/island galley equipment and dishwashing machines. Handles chemicals and food waste in all back of house galleys. Maintains and ensures cleanliness of areas to uphold USPH and Disney standards. Handles all guest questions and issues in an efficient, professional and friendly manner in a 24-hour operation. Answers and routes main switchboard calls. Handles cash and currency exchanges. Assists with guest deliveries. Provides guest information about ship, island and ports of call. This role has high guest interaction. Provides excellent guest service as the only Sommelier in Palo, an Italian-inspired fine dining restaurant for adults. Conducts guest wine-tasting events and seminars. Trains Dining Room and Beverage teams on wine service and product knowledge. 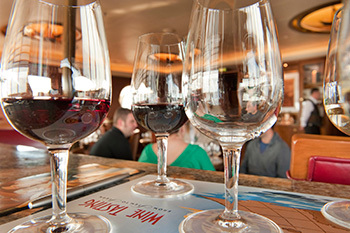 Monitors wine service and USPH standards onboard. Receives, completes an inventory and appropriately stores all deliveries to the ship. Prepares daily requisitions for food & beverage and general stores. 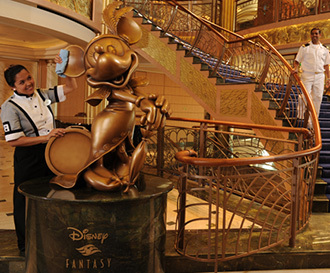 Maintains and ensures cleanliness of areas to uphold USPH and Disney standards. Ensures every food item leaving the galley is of the highest quality in flavor and presentation. 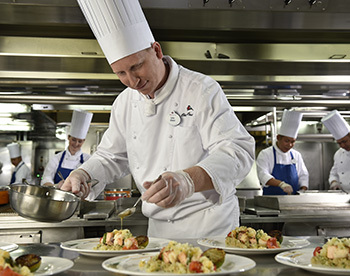 Leads designated culinary team of 12-20 crew members toward completion of daily work assignments, ensuring the highest level of guest satisfaction, crew support and financial/operational performance. Partners with Chef de Cuisine to lead a multi-cultural brigade in a high-volume, fast-paced kitchen environment. Responsible for an assigned section within the galley. Partners with First Steward to understand and monitor sanitation laws, policies and procedures. Ensures compliance with USPH standards. 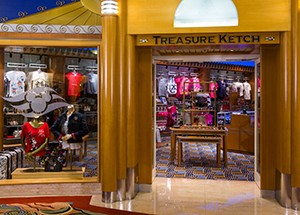 Provides friendly service while selling merchandise to guests in fixed and/or mobile retail locations throughout the ship and island. 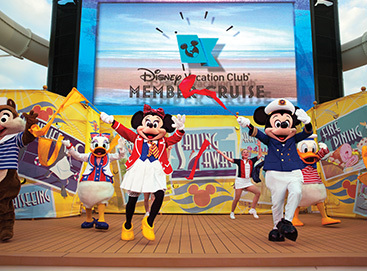 Product focus could include DCL specialty merchandise, onboard art program, duty-free products, jewelry and cosmetics. 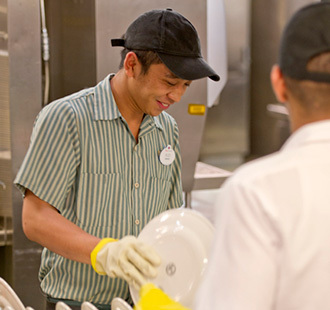 Maintains the cleanliness of all shops, stockrooms and stock shelves to uphold USPH and Disney standards. Assists with receiving of new merchandise while helping with stores, stocking and inventory. Maintains onboard crew store. 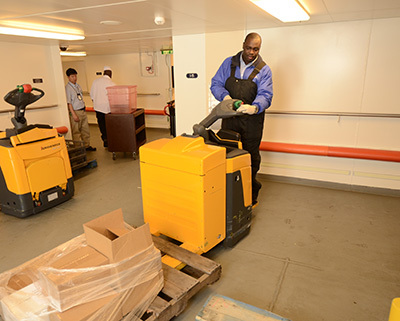 Receives, logs and unloads all merchandise that boards the vessel in preparation for each cruise. This role has high guest interaction. Provide extraordinary service with a personal touch, while maintaining our exceptional retailing standards and promotion of sales goals-- in fixed and/or mobile retail locations throughout the ship and island. Deliver excellence in every interaction, while displaying passion, kindness, and professionalism. 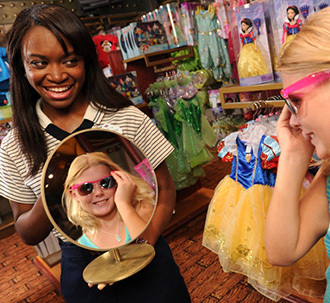 Develop emotional connections, have a strong ability to recognize guests’ wants and needs on a personal level, and the aptitude to execute on sales. 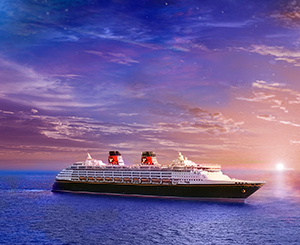 Product focus could include, but is not limited to luxury fine jewelry, DCL specialty merchandise, onboard art program, duty free products, liquor, and perfumes. 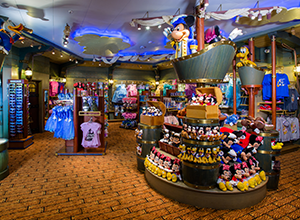 Maintain crew store, daily cleanliness and organization of shops’ floors, stockroom, and stock shelves to uphold USPH and Disney Standards. Receives, logs and unloads all merchandise that boards the vessel in preparation for each cruise. This role has high guest interaction. Provides quick and friendly service in all high-volume, fast food outlets and onboard/island buffets throughout the day. Keeps areas stocked with all supplies. Maintains and ensures cleanliness of areas to uphold USPH and Disney standards. This role has high guest interaction. 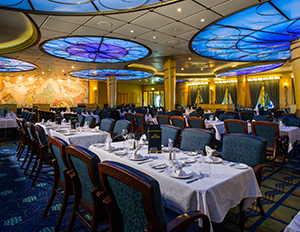 Remy is a sophisticated dining concept exclusively for adults on the Disney Dream & Disney Fantasy. 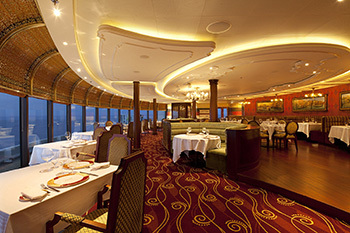 It boasts an exquisite, top-deck atmosphere with incredible ocean views. Remy serves French-inspired gourmet cuisine, from a menu created by award-winning Chefs. Positions in Remy include Maître D'hôtel, Chef Sommelier, Chef de Rang, Demi Chef de Rang, Chef de Cuisine, Chef Pâtissier, Chef de Partie and Demi Chef de Partie. Trains the Dining Room and Beverage staff on effective wine sales and food pairing techniques. Conducts wine seminars and tastings for guests. Orders and maintains all wine, liquor and related supplies for the wine cellar and service bar. 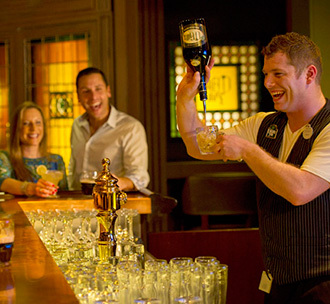 Provides leadership to Beverage team (Bartenders, Assistant Bartenders, Beverage Servers and Beverage Stewards). Oversees the opening and closing of all beverage service areas. Ensures service standards are met. Monitors bar supplies and consumption. Creates daily work schedules for crew. Oversees new hire training and ongoing service excellence training of crew. Conducts regular inspections. Ensures cleanliness of areas to uphold USPH and Disney standards. This position reports to the Beverage Manager and has high guest interaction. Provides leadership to a team of Guest Services Hosts/Hostesses. Supervises daily guest services operation. Creates daily work schedules for crew. Handles all guest issues within a 24-hour operation. Oversees training for crew. 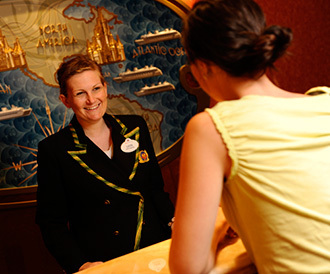 This position reports to the Guest Services Operations Manager and has high guest interaction. Provides leadership to a team of Hotel Stores Stewards. Responsible for ordering, issuance and discharging requests from onboard inventory system. Conducts inventories. Creates daily work schedules for crew. Oversees training for crew. Maintains and ensures cleanliness of areas to uphold USPH and Disney standards. This position reports to the Hotel Stores Manager and has low guest interaction. Provides leadership to a team of Merchandise Hosts/Hostesses. Ensures smooth and efficient operation of assigned guest and crew retail areas. Ensures cleanliness of all shops, stockrooms and stock shelves. Oversees receiving of new merchandise while helping with stores, stocking and inventory. Creates daily work schedules for crew. Oversees training for crew. Fills in for Manager, Merchandise in their absence, when needed. Ensures cleanliness of areas to uphold USPH and Disney standards. This position reports to the Manager, Merchandise and has high guest interaction. Provides leadership to a team of Quick Service Attendants. 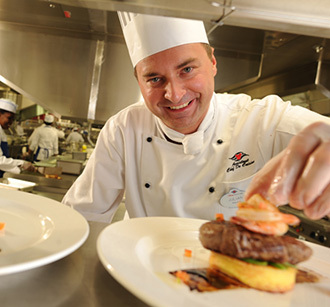 Oversees assigned quick service areas which can include Crew/Officer dining rooms, room service, buffet restaurants, fast food outlets, casual dining and open deck operation. Ensures service standards are met. Manages guest and crew special needs. Creates daily work schedules for crew. Oversees new hire training and ongoing service excellence training of crew. Conducts regular inspections. Ensures cleanliness of areas to uphold USPH and Disney standards. This position reports to the Quick Service Manager and has high guest interaction. Provides leadership to a portion of dining room team (Dining Room Server, Assistant Dining Room Server and Dining Room Attendant). Ensures service standards are met. Manages all guest special requests and dietary needs within section of dining room. Oversees new hire training and ongoing service excellence training of crew. Conducts regular inspections within dining room. Ensures cleanliness of areas to uphold USPH and Disney standards. 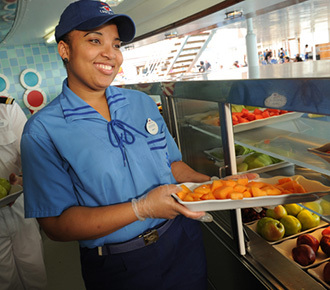 Also assists in overseeing fast food outlets and onboard/island buffets for breakfast and/or lunch. This position reports to the Restaurant Manager and has high guest interaction. This is a tipped position. 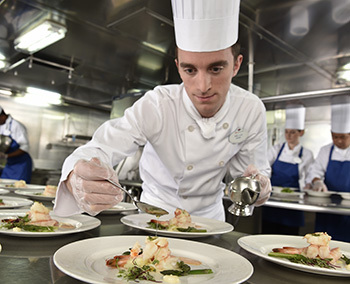 Provides leadership to galley team (Junior Sous Chef, Chef de Partie, Demi Chef de Partie and Commis Chef). Ensures seamless operation of all galleys and hotel stores. Coordinates all food offerings, including group offerings and special requests. Monitors all culinary standards. Oversees training for crew. Conducts regular inspections. Ensures cleanliness of areas to uphold USPH and Disney standards. This position reports to the Food Manager and has some guest interaction. 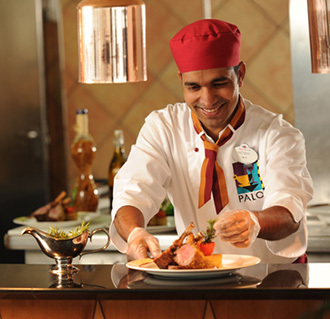 Provides leadership to Palo galley team (Junior Sous Chef, Chef de Partie, Demi Chef de Partie and Commis Chef). Ensures seamless operation of Palo galleys and hotel stores. Coordinates all Palo food offerings, including group offerings and special requests. Monitors Palo culinary standards. Oversees training for crew. Conducts regular inspections. Ensures cleanliness of areas to uphold USPH and Disney standards. This position reports to the Food Manager and has some guest interaction. Supervises daily operation of the Guest Services front desk. Creates daily work schedules and leads a team of Guest Services Hosts/Hostesses; follows up on daily assignments. Handles any guest service issues and follows through with guest service recovery. Implements training and development for Guest Services and Concierge. Monitors daily bank out process for crew. 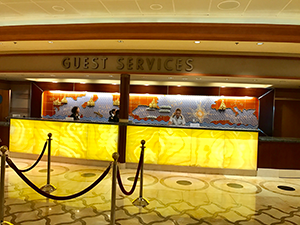 Assists in all other areas of Guest Services and/or the Crew Services Office. Reports to Manager, Guest Services. This position has high guest interaction. 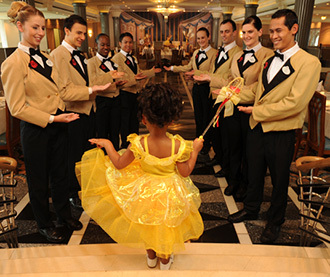 Provides leadership to a portion of the Housekeeping team (Stateroom Hosts/Hostesses/Custodial Hosts/Hostesses, Housepersons and Custodial/Floor Care). 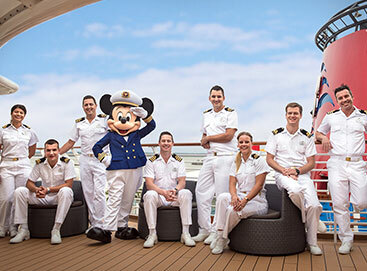 Responsible for housekeeping related activities in all guest public areas, staterooms and crew accommodations. 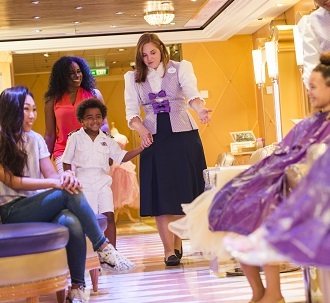 Oversees cleanliness and upkeep of 175 suites, staterooms, pantries, crew cabin areas, back-of-house and public spaces within allocated section. Handles all guest special requests within section. Creates daily work schedules for crew. Oversees training for crew. Ensures reporting of all maintenance issues and inspections. Ensures cleanliness of areas to uphold USPH and Disney standards. This position reports to the First Housekeeper and has high guest interaction.